Stiltwalking is an element of legends, rituals and festivals throughout the world, particularly in celebrations of growth and achievement. Children and adults alike gravitate to a stilted character towering head and feet above the crowd. 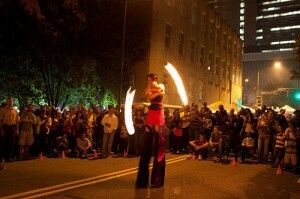 Fire / Non-fire and Indoor / Outdoor stilt performances available.